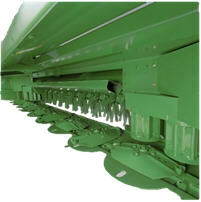 An adjustable swathboard kit is now available for customers desiring maximum windrow width. This kit will increase windrow width approximately 1-ft. depending on crop conditions. 45 in. to 85 in. 45 in. to 97 in. 36 in. to 85 in. 36 in. to 97 in. Installation will take approximately 1 to 3 hours.